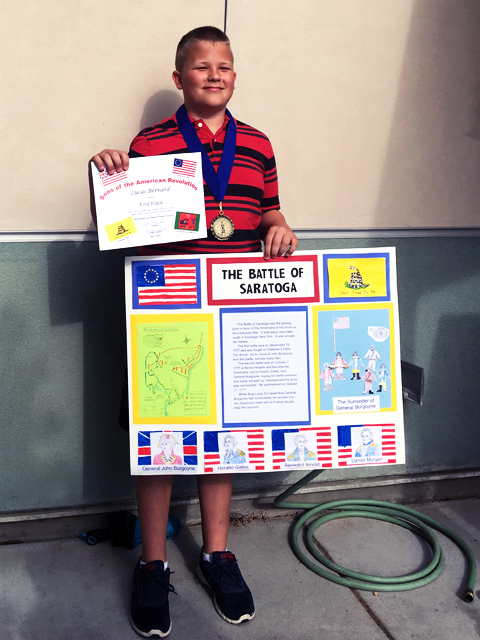 The youth programs sponsored by the National Society, Sons of the American Revolution include an elementary school poster contest to stimulate interest in American History and support fifth grade US History curriculums. Each year the poster topic is changed to recognize a person or event of significance during the American Revolution. For academic years ending in even numbers, the theme shall be "Revolutionary War Events." For academic years ending in odd numbers, the theme shall be "Revolutionary War Person or Persons." The 2018 first place winner of the Delta Chapter and also the first place winner at the California Society Annual Meeting was Lucas Bernard of Walnut Elementary School in Turlock. Fifth Grade Students Only, to fit with the California public school curriculum. Posters must be on Standard 22x28 inch poster board. Posters should not be framed or enhanced in any way by submitting Chapter. No "3-D" posters will be accepted. No group project posters. Each poster must be the product on one individual. The posters must conform to the yearly theme and show evidence of research. On the back of the poster record: Student Name, Age, Grade, Teacher Name, School Name, District, Sponsoring SAR Chapter - "Delta Chapter"
DO NOT Print the Student's or School's name on the front of the poster. Each Chapter MAY submit TWO posters for judging at the CASSAR Spring Meeting.